Much like Walking Fern Falls, Hospital Rock Falls are not worthy of being a destination. The falls are just extra icing after you climb Little Pinnacle Mountain via the very strenuous Pinnacle Pass Trail. 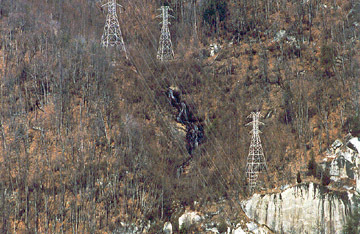 The falls, flowing on Rocky Branch, are in the power line right-of-way on Standingstone Mountain. They are named after the rock formation downstream rumored to have been a hospital and hiding spot for deserters during the Civil War. Be sure to register at the trail box before hiking. Start out on the Jones Gap Trail (blue-blaze) and follow it upstream for about 100 yards to where it intersects the Rim of The Gap trail. Turn left onto the yellow-blazed Rim of The Gap Trail for .4 mile until it intersects with the Pinnancle Pass Trail near a small creek. Follow the orange-blazed Pinnacle Pass Trail for .6 mile to Walking Fern Falls. Then, keep going up Pinnacle Pass' steep switchbacks for about another mile to where the trail drops down onto a rock abutment for an incredible view of Jones Gap. 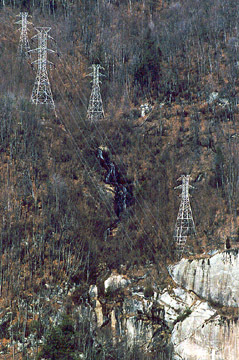 Look on the opposite mountainside and follow the power line to fin the falls. Bring plenty of water, binoculars and/or a good zoom lens. Cleveland Cliffs and Standingstone Mountain. 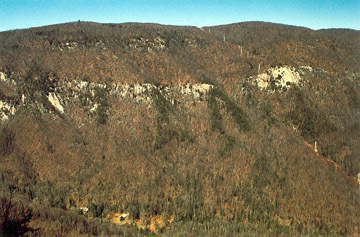 Note the Jones Gap State Park buildings in the bottom left. Directions: Jones Gap State Park is off SC 11 in northern Greenville county. 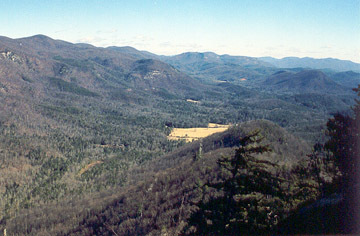 From Travelers Rest, SC, take US 276 toward Table Rock State Park, Marietta and Cleveland. North of the town of Marietta, US 276 and SC 11 will intersect and join together for a few miles. These combined roads will pass through the town of Cleveland. After a couple miles, look for the Big Bear woodcarving shop on the left and the F-Mart convenience store on the right. Turn right onto River Falls Road. 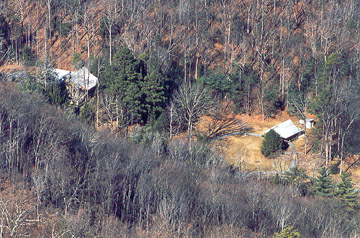 There should be a sign directing you to Jones Gap State Park. Follow curvy River Falls Road and the park signs for about four miles to Jones Gap State Park. Park in the lot, follow a short path up the hill into the woods, cross the Middle Saluda on a metal footbridge and enter the park. An old trout pond from the Cleveland Fish Hatchery is on the right, the park bathroom is the near building on the right, and the park office/education center is the far building on the right. 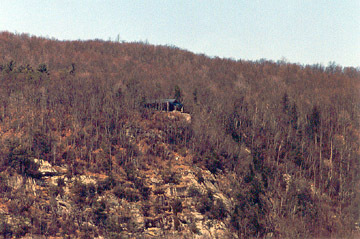 The Jones Gap Trail starts at the bulletin board at the wooden vehicle bridge (about 100 yards upstream of the metal bridge).